Nokia licensee HMD Global is expected to launch the much-anticipated Nokia 9 flagship next month, with an event in China said to be the venue. The refresh of the Nokia 6, being referred to as the Nokia 6 (2018), is expected to be launched alongside. Both rumoured smartphones have been the recipients of numerous leaks, including a TENAA listing for the latter, cheaper offering that left virtually no detail to the imagination. Now, a Nokia Camera app build spotted in the Android Oreo beta for the Nokia 5 has tipped the upcoming use of a new type of dual camera setup expected to be seen on the Nokia 9 - a wide-angle lens coupled with a telephoto lens. Spotted by Nokiamob.net, the Nokia Camera v8.0200.20 app on the Nokia 5 Android 8.0 Oreo beta build was torn down, and showed telephoto lens options up to 2x zoom, and wide-angle lens options (seen below). 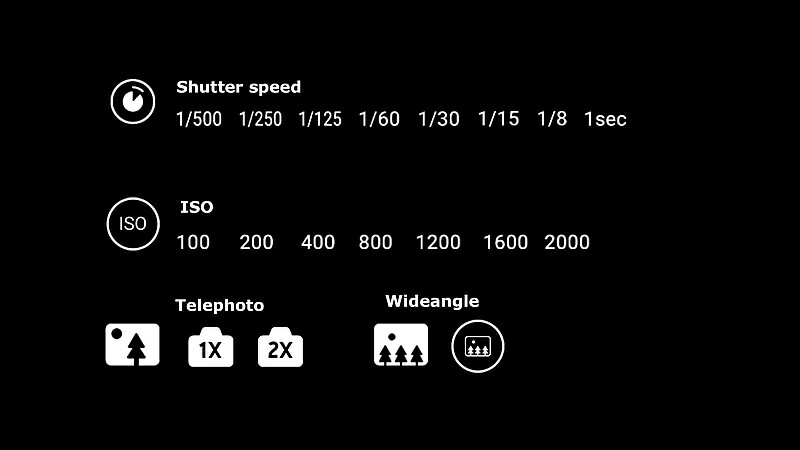 Alongside, more manual settings have been added: users will be able to adjust shutter speed between 1s and 1/500s, and choose from ISO 100 to 2,000. This is being thought to mean that Nokia has chosen to forego the RGB/ monochrome dual camera setup it used on the Nokia 8, and brought two RGB sensors with different fields of view and zoom capabilities on an upcoming smartphone - probably the Nokia 9. The Nokia 9 and Nokia 6 (2018) were most recently in the news for reportedly being spotted on 3C - a Chinese certification authority. The 3C certification of the Nokia 9 and Nokia 6 (2018) didn't reveal any details on the part of their specifications. The Nokia 9 is said to be listed with model number TA-1042, whereas the Nokia 6 (2018) has been spotted as TA-1054. There is also a speculation that the Nokia 9 will come in two other variants with model numbers TA-1005 and TA-1009. Earlier this month, the Nokia 6 (2018) reportedly received TENAA certification in China - with a matching model number of TA-1054. Some early rumours claimed that the smartphone will have a similar design language as the Nokia 7 and will come with an 18:9 display. Also, it is expected to have a Qualcomm Snapdragon 630 SoC, coupled with 4GB RAM and 32GB onboard storage, and a dual camera setup on the back with the company's iconic Bothie feature. The Nokia 9 and Nokia 6 (2018) are expected to be launched at a January 19 event in China.